If you aren’t familiar with Apple products, it can be difficult to fully understand what you’re looking at when you see an unusual file extension. One of these unusual files might end with the .pages extension. When you see a file with a .pages extension, that means the file is formatted to be edited by the Apple Pages app, one of three apps originally developed for the iWork software package. 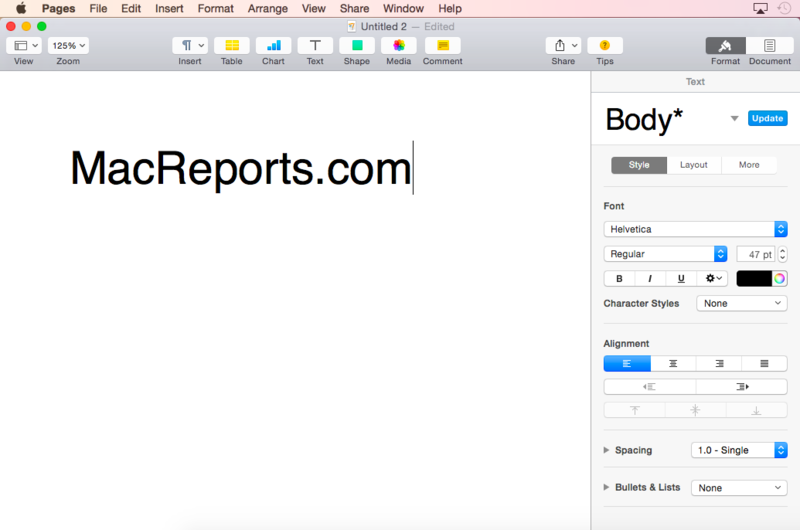 Pages is the Apple version of a word processor, much like Microsoft Word. One of the most useful characteristics of the app is that it’s designed for use on the entire suite of Apple mobile devices as well as their line of personal computers. The Pages app has gone through many iterations before arriving at the state-of-the-art piece of software we are familiar with. It was originally released to the public in February of 2005, and since then it has undergone four major updates and nearly thirty minor adjustments. The current version, Pages 5, was initially released in October of 2013, and at that time it was made free on all current iOS devices. There have been a few small updates to version 5, primarily to address compatibility issues with OS X El Capitan. Just a few years ago, Apple released an updated version of the iWork productivity suite and made it free on all iOS devices. Anyone with an iPhone or iPad can now download a free version of Pages on their device, and it delivers the same level of functionality as the computer based app. In fact, if you have a Mac, you can migrate files back and forth between your mobile device and your desktop or laptop using iCloud. This level of convenience gives Pages users access to their files wherever they are, and gives them the ability to work on those files in the most effective way possible. When you’re ready to use the app or open a .pages file, all you must do is select the app icon on your mobile device, or double click the file or app icon on your computer. 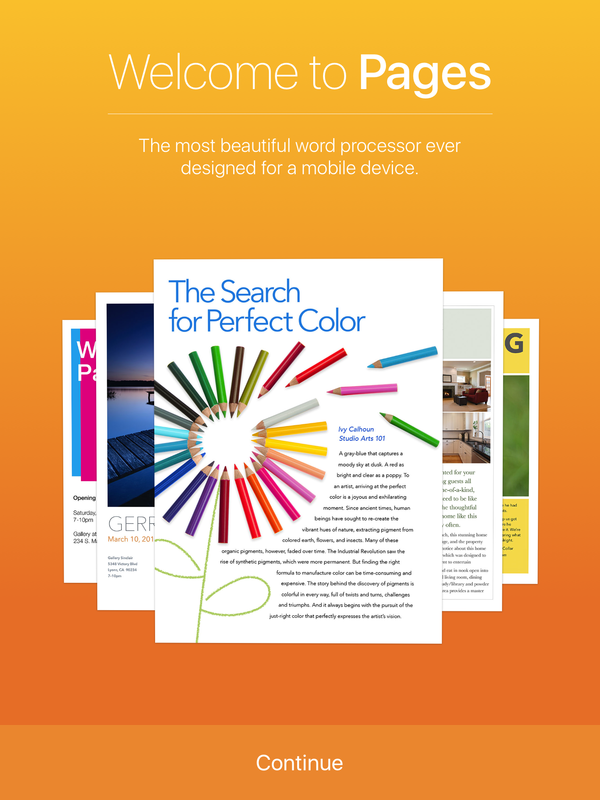 Pages for iOS (iPhone and iPad) – Download. 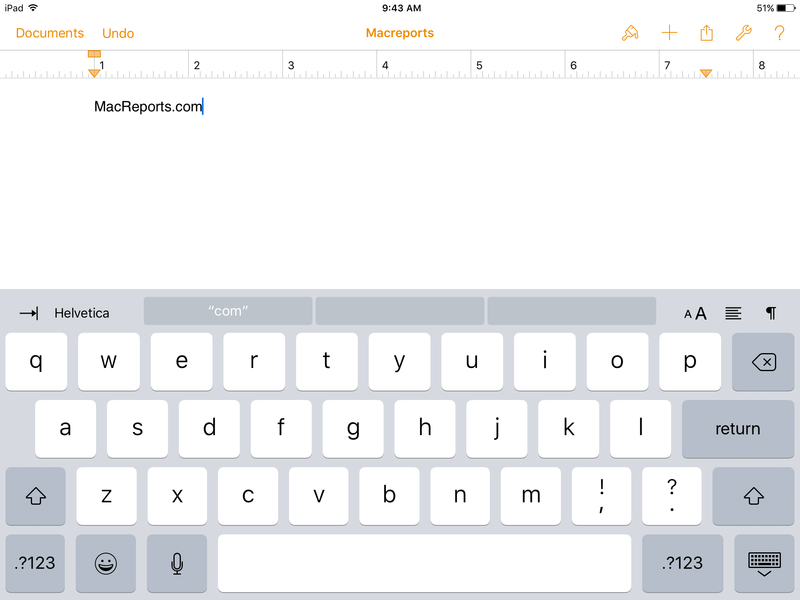 Pages for iOS has been designed for the iPad, iPhone, and iPod touch. Pages for iCloud -visit icloud.com. Everyone can use this. You need to have an Apple ID. If not, you can create one easily. There are even newsletter templates with placeholder text to show you how they look when filled. This list only represents a small portion of the template genres, and the variety is such that no two documents will ever have to be the same. Pages includes a number of editing and formatting features that make it simple to use. The most common functions are placed at the top of each document window for convenience, and a formatting bar allows for quick changes to the layout of the document. The user can control text size, color, and font, adjust the dimensions of the document, or add and edit tabs. The user can quickly adjust view mode and zoom with the conspicuously placed drop down menus near the top left of each window, and any document can be shared instantly with the conveniently located Share button. If the user adds an image to the document, the format bar shows options for changing opacity, adding reflections or shadows, and creating layer masks. If you choose, a separate window called the Inspector can be selected that holds nearly all possible formatting options in one convenient location. An included Media Browser allows the user to quickly look through Aperture, Photos, iMovie, or iTunes for additional media. When combined with the page layout mode, which is ideal for showing objects over text, this gives the user the ultimate tool for creating documents filled with expertly placed images. Standard word processing mode is better for dealing with text, and it provides several key features that make it easy to use, like side notes, collaborative changes, and change tracking. If a table or graph is inserted from Numbers, Apple’s spreadsheet app, it will update in the Pages file when the original Numbers file is edited. Pages includes one additional mode call ‘Full Screen’, which removes everything from the screen except the document the user is currently editing. It even removes the excess toolbars, giving the user nothing on which to focus but the document itself. Pages can be used with any .pages files, and it can function with some recent Microsoft Word document filetypes. 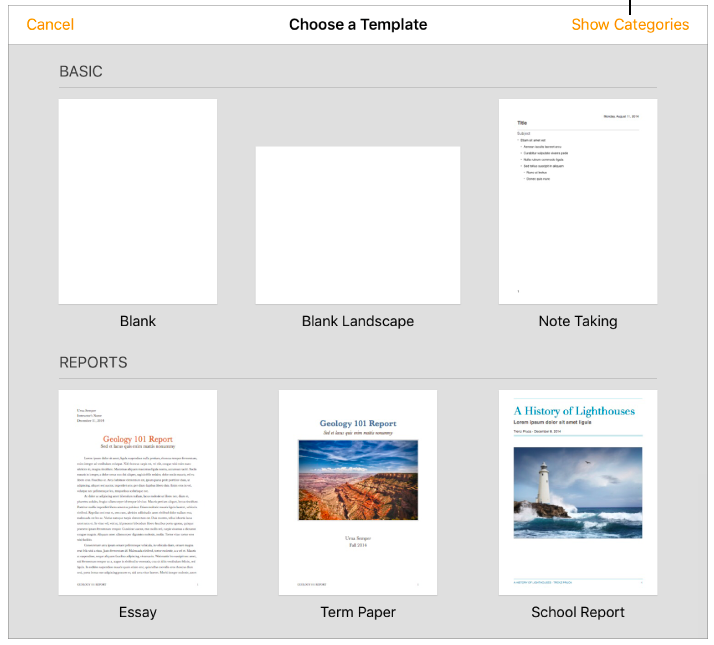 Documents created in Pages can be exported to PDF, Microsoft Word, EPUB, or Pages formats. No apps exist that can open, edit, or view Pages files in either Linux or Windows, so Pages files can only be viewed or edited with Apple iOS devices or Mac computers. 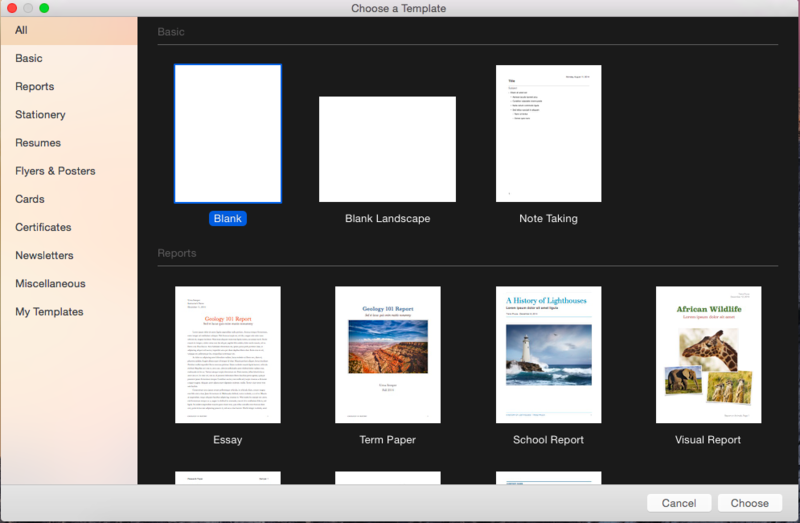 The Pages app itself is compatible with the most recent version of iOS and OS X. Older versions of the Pages app may no longer be compatible with the newest software, but upgrading to the updated software is free. If you have filetypes from the older versions of Pages, you may be able to import them to the newest version by extracting the data from the older files. In order to use version 5 of Pages, which is the most recent version, you must have a Mac computer with Mac OS X 10.9 Mavericks or later. When you install the iWork suite, which includes Pages, the system will not overwrite older versions of iWork. Pages for iOS is available free of charge for all those who activated their Apple mobile device on or after September 1, 2013. You mobile device must have iOS 9 to take advantage of the word processing power of Pages. There seems to be a wide difference between features of the iOS, iCloud, and Mac versions at least when it comes to things like creating templates, placeholder text, custom styles, etc. It sure would be nice to see a side by side comparison of the capabilities of each. I’ve been pulling my hair out trying to make sense of Apple’s pathetic documentation on each of these releases as I am trying to create some templates of my own. On top of things, the “free” latest Mac version would require me to replace my loaded early 2009 Mac Pro which Apple in its great wisdom has decided to obsolete on me. Any help with the answer to “How do I create templates with placeholder text on all three platforms?” will be greatly appreciated.